You need to purchase the correct size beaded above ground swimming pool liner. If you need a 48″ beaded pool liner, you cannot use a 52″ beaded pool liner and vice versa… they will not fit your pool correctly. Our Swimline above ground swimming pool beaded liners come in a variety of patterns. We have solid blue, aquarium tile, and other patterns in 20 and 25 guage material. 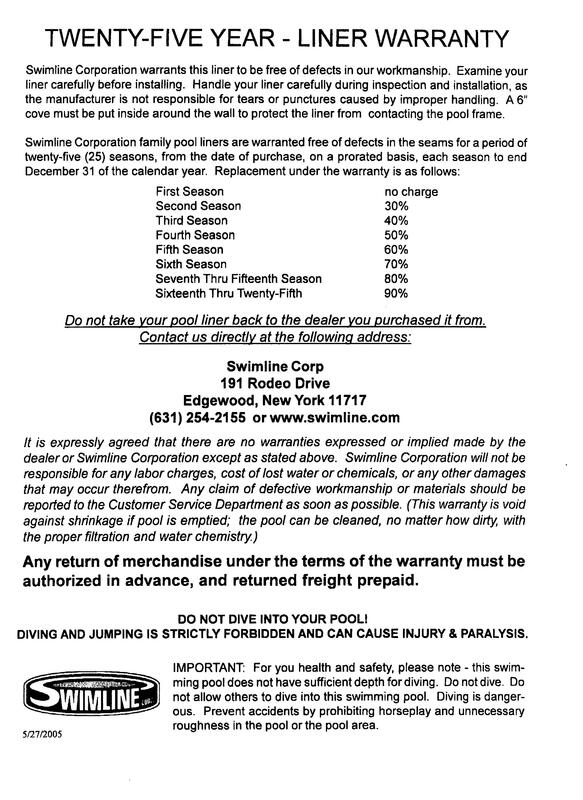 If you’re looking for an Esther Williams swimming pool liner, please verify your wall height before purchase. www.megapoolandspa.com has a big selection of above ground swimming pool liners. We have overlap pool liners, beaded pool liners, unibead, expandable swimming pool liners, and j hook swimming pool liners for aboveground swimming pools. We stock a large selection of patterns and sizes and can make custom pool liners. Mega Pool and Spa stocks above ground swimming pool liners in many shapes and sizes. Our Pool Liners Ship Free and there is no handling fee. What is a Unibead or J hook Swimming Pool Liner? Uni-bead or Jhook? Unibead or J Hook Liners slips over the top of your pool wall and hangs straight and securely on your pool. Upgrade your overlap swimming pool liner with this deluxe designer pattern! Unibead Above Ground Swimming Pool Liners are easier to install then overlap liners and they allow you to have the beautiful designer border found only on beaded type swimming pool liners. The liner’s “J” hook simply slips over the top of your pool wall and hangs straight and securely into your pool. Our uni-bead liners, also called J hook liners, also fit pools with bead receivers. 25 year pro-rated warranty. Our J hook liner is available in 48″ or 52″ depths. Where can you buy Beaded Swimming Pool Liners for Esther Williams Pools? At www.megapoolandspa.com, we have a great selection of beaded swimming pool liners. We stock tons of sizes and patterns. The liners we carry are made by Swimline, not Esther Williams. However, these are made to fit most models, so if you need a new Esther Williams Pool Liner , please visit our website. Mega Pool and Spa has the cheapest price for above ground swimming pool liners. If you need a plain blue overlap pool liner, we have liners that can be delivered to you in a few days for less than $100!!! Our aboveground swimming pool liners come in a variety of sizes and we can have custom sizes made in a few days.